This is really not about food, rather just something fun. I know how can that be? It turns out as luck would have it I invested in the new iPod shuffle for trip to Australia. The day after I bought the shuffle 5 new ones were released. Go figure. Though the only change is color. Anyway, despite missing the new releases, I am really happy with the shuffle . First, it is tiny. Second, it is functional. We have larger iPods which we use at home and in the car. Though there size is a bit cumbersome for just walking around or going to the gym. (Yes I said gym, on the cruise you need the gym) The new shuffle is the size of a large postage stamp and it holds 250 songs. There is no way I can work out that long or even listen that long on the airplane. Also, it can just grab songs from your music library randomly. More often than not, I listen to my iPod on shuffle, so this is just a more approachable micro version of the original. And I can change up my songs whenever I choose. (I cannot travel without my computer.) Finally, the shuffle is like life, I never know what is going to play next. We're off to Sydney this afternoon. We're flying there via Los Angeles, with a three hour layover. We leave at 4pm on January 31 and arrive in Sydney, Australia at 8am on Feb. 2. Should be quite a trip. We're very excited to do another culinary cruise with Holland America. But we are leaving with slightly heavy hearts because Patty had surgery on her ear this past Monday. 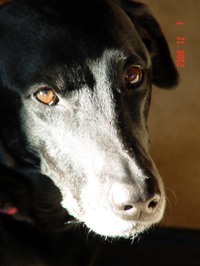 She developed a nasty hematoma from flapping her ears that had to be removed,along with some torn cartilage and various yuck. She will be recovering with a huge plastic tube around her head for the next three weeks. Fortunately we got her settled at home yesterday, with lots of love and attention, and we know that she has a very capable nurse in the form of Aunt Marie. We hate to leave her but the show must go on. Once we've done the demonstrations, we'll post the recipes here to share with all of you. We're looking forward to meeting new culinary enthusiasts and experiencing as much as we can of Australia and New Zealand during our time in the ports. It's not quite real to me yet, that we're actually going there. I don't think it will sink in until we get off the plane in Sydney. We'll be out of a touch for a couple of days although we've set up some posts to publish while we're traveling. It'll be our first experience in Business Class, one of the perks of the cruise, and I don't know if there will be Internet access or not. We'll just have to see how it goes. We'll be stopping in Melbourne, Burnie, Milford Sound, Fjordland Park, Dunedin, Christchurch, Picton, Wellington, Napier and Tauranga. We'll be in most of these ports for a good eight hours to explore so if anyone has any suggestions please send an email or leave a comment. Any advice would be appreciated! And no, unfortunately we won't be going to Tetsuya, we're not in Sydney long enough to make that happen. There are shore excursions through the cruise but we may just rent a car and explore on our own. It's a once in a lifetime experience for us and we plan to savor every moment. Well, we have now finished our first food photo shoot for someone else. We did an array of pictures for The MouCo Cheese Company . We have been using there cheese for a number of years. It is tasty, unique and approachable. They make three great cheeses: ColoRouge, Blu and Camembert. We have served the cheeses simply with a bit of pate on a baguette as a rustic snack or synergistically with sake cured roe and maple poached sunchokes. Our appreciation for the cheeses led to the MouCo team asking if we would be interested in photographing their cheeses and our cheese dishes for them to use. We responded with an immediate yes. We had never really taken pictures for someone else before, so this was a definite learning experience. While not every picture or dish was used, we became more engaged in the relationship between ingredients and the picture taking process. Here is a picture of the MouCo Blu cheese which did not make the cut. 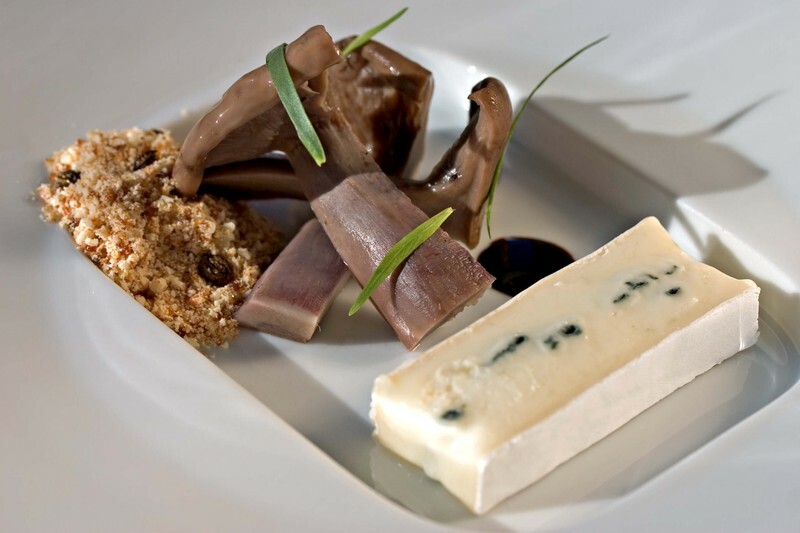 The dish consists of a slab of the tender blue cheese with blue foot mushrooms, almond crumble, aged balsamic vinegar and papaya seeds. The picture itself is a great. The catch is that the mushrooms are the star in focus and highlighted. The cheese while crisp, is only an accompaniment. At least it is in the picture. 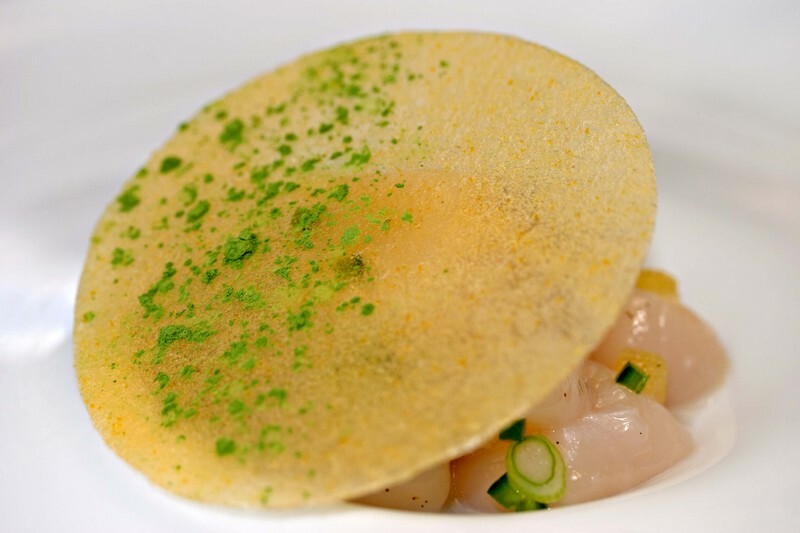 The dish itself balances textures, tastes and temperatures. Here is a dish of chilled oysters with sudachi dressed calamari salad, green tea-sheep's milk yogurt, elderflower and kimchee bubbles. This dish came together because we were filling in voids. 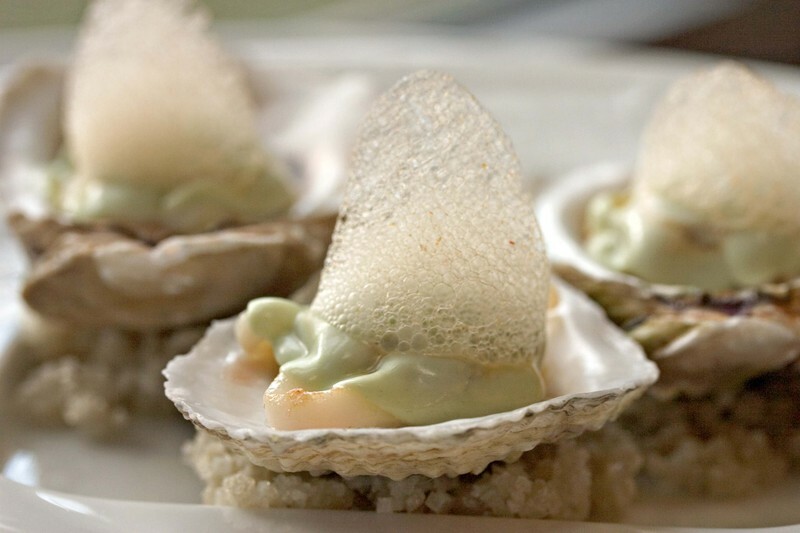 An oyster is great, but it could use a bit of acid and some texture to play off its tender explosive nature. And spice, that would be nice. 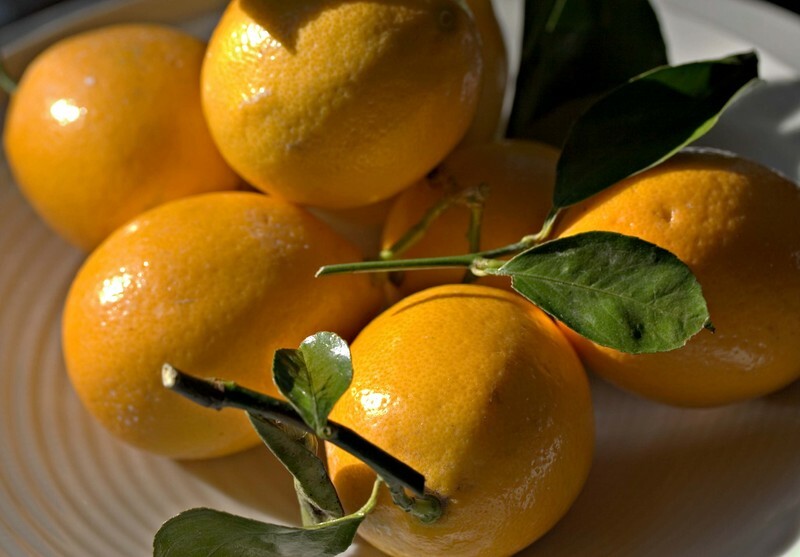 A tangy richness would balance the palate and a bit of bitterness could pull in the reins. And so we began. The spice comes from the bubbles of kimchee, the texture and acid from the calamari salad. The tangy richness is in the yogurt as is the bitterness from the green tea. We balanced the green tea yogurt with some elderflower syrup, its taste and aroma mirroring that of litchi's in syrup. Thus we created this dish by merely filling in the voids. As many of our readers know, I grew up in Queens. I lived with my Mom and my Aunt. I went to high school in Manhattan with a 40-75 minute commute, depending on delays, by subway. Basically nobody in our house got home in the evenings until 5pm and often times much later. We ate a lot of take-out and went out to restaurants on a regular basis. Given our schedules it was faster and easier than visiting the supermarket and then coming home and cooking dinner. The few weeknight meals that we actually cooked at home were usually broiled steak or chops with salad, or pasta with rock lobster sauce from a can. I used to love that Rock Lobster sauce. All of the ingredients were easily and quickly put together. These meals were usually made on nights when someone needed to go to the supermarket to pick up pet food. Making a special trip to the market for cooking ingredients only happened on the weekends when someone actually had time to spend in the kitchen. At that time, our household was not the norm. It was the beginning of the age of divorced parents and many of my friends still had stay at home moms who cooked dinner every night. In elementary school in Forest Hills, a packed lunch from home was more common than my deli bag or Blimpie sandwich. Most kids thought that their Moms were great cooks and meals out were mostly weekend events or special occasions. The prevailing wisdom seemed to be that if the food at home was good, then there was no reason to go out for your meals. By high school though, we all picked up bagels, coffee, and egg sandwiches at the deli for breakfast, had the lunch special at the Chinese restaurant or a dog from the cart or burgers at the diner for lunch, and then hung out at the local pizza place after school. Dining out had already become a way of socializing, ingrained in our young psyches. Fast forward to recent times and eating out has become commonplace nationwide. The city life of constantly visiting restaurants, picking up take-out on the way home or ordering in delivery food has become the norm. Old school dinner parties have faded with the younger generations. Everyone tends to meet in bars and restaurants to interact. Entire industries have developed around fast food and there are countless places emulating old school "comfort food". Comfort food is being defined as the food we used to get at home, the food that no one had time cook anymore. We used to go to restaurant to celebrate a special occasion or to get the kind of food that we couldn't make at home. Now people go to restaurants simply to be fed. The result of this increased pool of diners eating out is the proliferation of mediocre restaurants. Because so few people can or want to cook at home, restaurants are able to get by on menu descriptions and the idea of good food. Commercials and advertisements depict happy families and savory looking pastas at the Olive Garden , strong fishermen and delectable seafood at Red Lobster, and young hipsters and aging frat boys chowing down on gooey pizzas at Pizza Hut. Clearly the advertisers have never set foot into any of these chains or they would know that the food and the patrons look and feel vastly different in the real world. But the continued success of these kinds of establishments makes it clear that it's not necessarily about reality. These places are selling an ideal. Even those of us who pride ourselves on visiting the independent restaurants are often sacrificing taste for that "Cheers feeling" of being known at a neighborhood joint where the food is usually pretty good, there are signature dishes that you order most of the time, and the owner or host knows you by name. It's often only at places where the service is cold or you're just passing through for special occasion that the food is greeted with a critical eye. At our favorite places, the occasional (or daily) culinary flops and missteps pass largely ignored because you're in your comfort zone. Almost anything is forgiven and good enough is still a better deal than employing the effort entailed in cooking for yourself at home. On the bright side, the rapidly increasing number of surprisingly expensive and dreary restaurants has actually led to an increase in the number of people cooking at home. 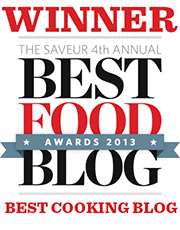 The social aspects of the blogosphere has also led to renewed interest in home cooking. Faced with the option of spending $20-$40+/per person in a mid-level restaurant for dinner, many people would rather spend $8.00 on the occasional great sandwich or decent Chinese takeout and buy better ingredients to cook with at home. There are few restaurants that present better food than the average home cook. What they do offer is the camaraderie of others and table service. The lure of having someone else cook and clean up is a siren call to each of us at one time or another. We professional cooks tend to be the first ones suckered in. On our days off we want to go out to eat. We want to experience other people's food, be exposed to new ideas, and we want to not wash any dishes. We may think we want to cook our own food on a day off, but the caveat is that there must be someone to cook for (preferably someone who will appreciate our efforts). Otherwise we usually convince ourselves that it would be more beneficial for our education to go out to eat. We have to stay abreast of the trends and see what other cooks are doing. Besides, a line cook is usually exhausted by the time their day off rolls around. Their job is physical and stressful and they need to recharge. What better way to do that then to let someone else do the cooking? Since our goal is usually to see and taste as much as possible, our bills tend to be on the more expensive side, even at seemingly casual restaurants. There have been a few restaurants where we felt the money was well spent. I never mind paying for quality. But as prices creep inexorably higher that feeling of contentment is much harder to experience. These days the price to satisfaction ratio is hardly ever in our favor. What I find baffling about this is the amazing number of truly passionate cooks that I've encountered over the years. People love what they do, are fascinated by food and are inspired to create great things. So why aren't there more great restaurants? We know there are plenty of diners out there who want great food. The popularity of websites like eGullet and Mouthfuls, the Food Network and the ever-increasing number of food blogs prove that the demand exists. Who will be able to step up and fill that demand? My prediction is that the proliferation of small restaurants is the beginning of the new wave rising up to fill the demand. You will see them increasing in number and becoming better restaurants in general and more individual expressions of their creators overall. Smaller restaurants allow for more creativity because there are fewer investors, smaller staffs and less seats to fill. Rents are less expensive, utilities and overhead are also proportional to size and the combination of these factors allow the proprietors the flexibility to express unique styles of food and service and to take risks in a way that is not possible in a larger place. The younger generations coming of age right now are more entrepreneurial than in the past. They are looking for ways to work for themselves and tend to value quality of life over career aspirations. It's an interesting shift and one that I agree with whole-heartedly. I think that we should be able to create wonderful, exciting restaurants and still be able too ensure an enjoyable quality of life for ourselves and for our staff. The days when aspiring line cooks stoically worked 15 hours a day, six days a week, for a pittance are coming to an end. It's the dawn of a new era and we need to make some serious changes to bring our industry into modern times. We can start small and dream large. Today we began work on a pistachio crust. 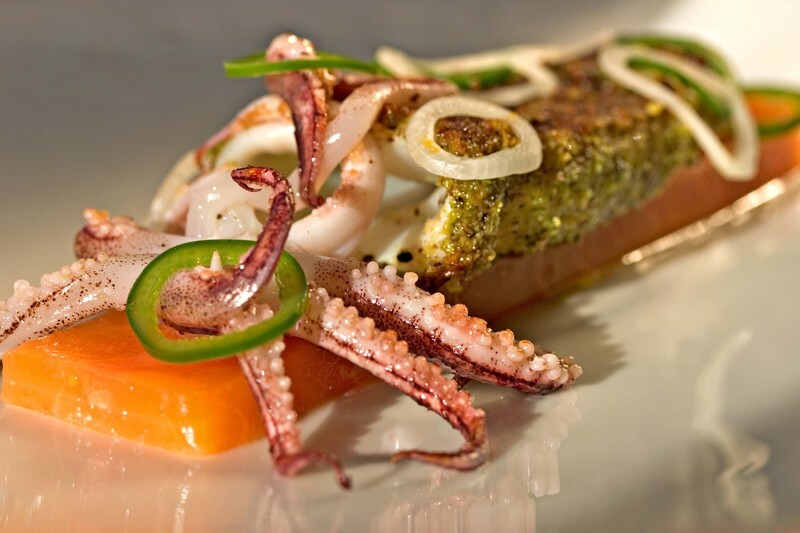 We used it to crust calamari which we paired with compressed papaya and pickled onions and jalapeno. This is a pile of our Moo cards. Who are you? What do you do? How can I get in touch with you? What makes you different? All these questions and more can be answered on and with a business card. Business cards tell stories, some good, some bad and some just plain boring. Up until today we did not have a business card. We were forced to scribble information on post it notes, napkins or some other form of disposable paper. In fact, most business cards are disposable and often disposed of. So, the question becomes how to make a card that people want to keep or even collect? Well, we were pointed in the direction of Moo Cards by one of our readers who has helped us on many projects. 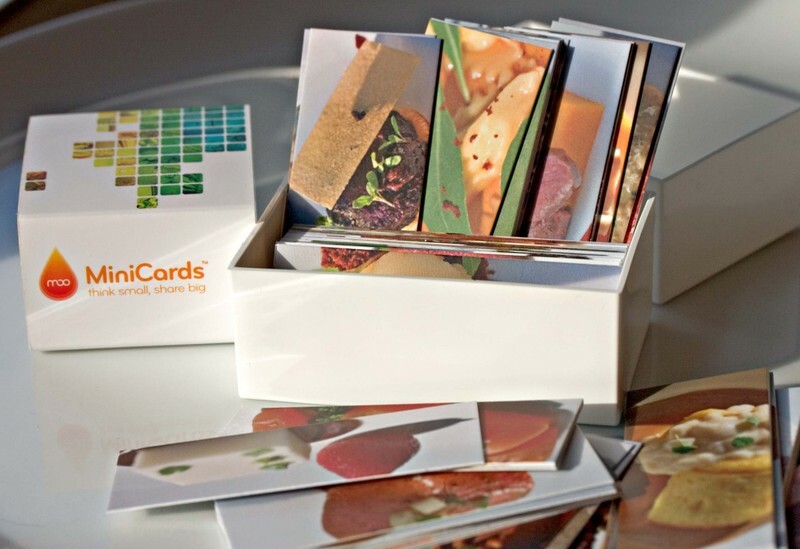 Moo cards work in conjunction with Flickr and user generated photo sets. I am not sure if Moo cards were truly designed to be business cards as opposed to a social networking tool, though in thinking about it they are one in the same. Moo cards are simple, some would say stark. They are also small, actually half the size of traditional business cards. Yet, the cards contain all the information we would want them to have as well as a distinguishing photograph on the front. When we put our cards together we used 100 pictures to create 100 unique cards. Each card has a cropped almost artistic cut of one of the 100 pictures. That way, when you hand someone your card more than once the odds of being redundant are quite slim. All humor aside, these are some of the most interesting cards I have seen guaranteed to tell our story. We came across these new molds at JB Prince. The molds are made of silicone and can be heated and frozen with out affecting the internal ingredients. These molds were designed for chocolate and sugar work. We now use them for eggs and cauliflower. 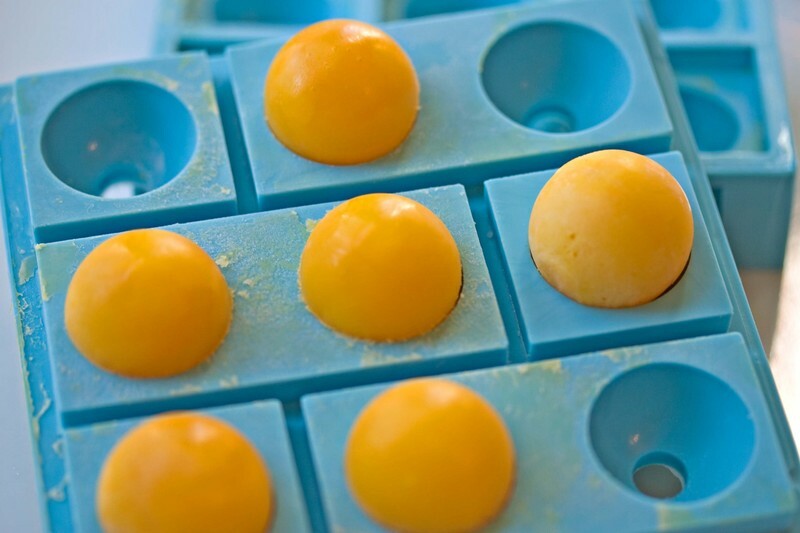 The molds allow us to season and then slow cook miniature egg yolks or form the base for our hot panna cotta, which can then be frozen and poached to order. In fact, with a variety of sizes we can actually make and shape ingredients in spherical layers. We also have plans for round shrimp, spheres of foie gras, round fried baked potatoes, liquid filled hot and cold panna cotta and much much more. We found some beautiful tiny cucumbers at the store yesterday. It sparked the idea of cucumber rigatoni. 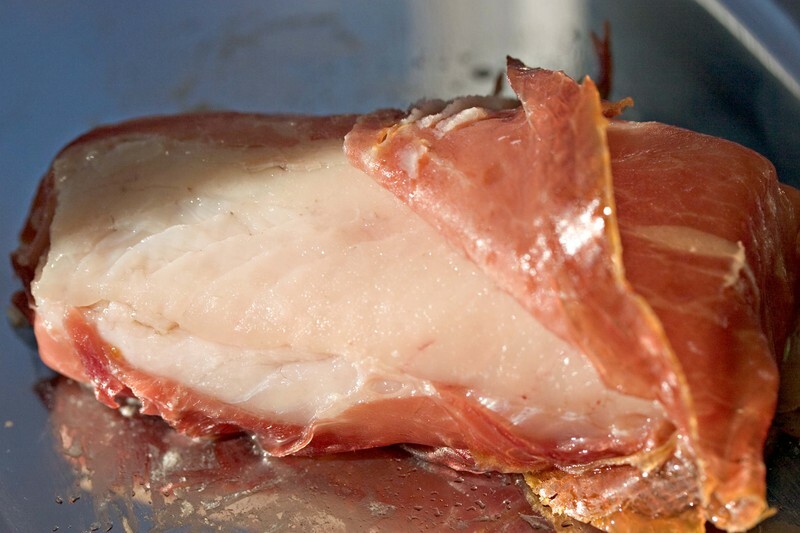 In following the Italian theme, we wrapped and roasted flounder in prosciutto to season the fish and then peeled it away to expose the firm flaked fish beneath. We paired the two together with some shimeji mushrooms and mortadella bubbles. The cucumbers were cooked sous vide and then sauteed on the pick-up so they were slightly denser than raw cucumbers, tender on the outside and still slightly crunchy in the center. The texture mimicked "al dente" pasta that had been slightly under-cooked. 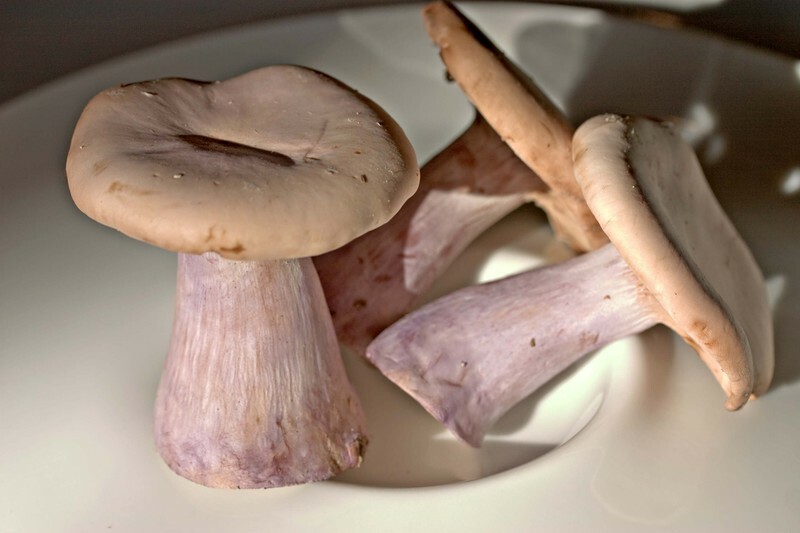 The mushrooms were soft and slippery with a sweet flavor and some delicate earthy notes. The cheese added a hint of creaminess and really pulled the everything together. The fish was tender and toothsome. The flavors of the mortadella hit the front palate giving way to the light, clean flavors of the fluke and finishing on the slightly game-y notes from the prosciutto wrapping. All in all we were quite pleased with the way this dish came together. 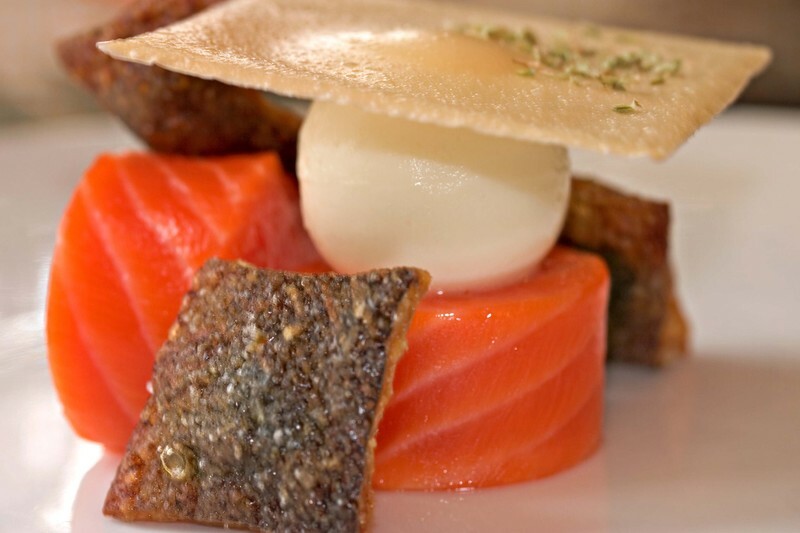 Here is our slow cooked Tasmanian Sea Trout with warm cauliflower panna cotta, cauliflower crisp and oregano scented crispy skin puffs. I truly cannot believe what I stumbled across today, but through Amazon there are fourteen copies (as of this writing) of the American translation of Fredy Girardet's first cookbook, starting at only five dollars. If you do not know who he is that is alright, get the book and become inspired. 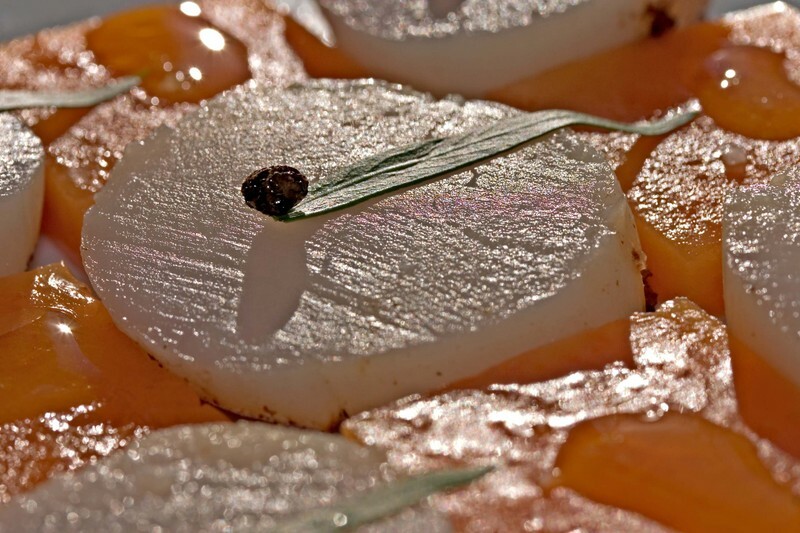 Yesterday we candied some papaya seeds to act as a spicy accent for this scallop dish. The papaya is compressed and gently cooked, then we serve it with seared and sliced scallops which are topped with candied papaya seeds and tarragon. A few drops of olive oil and lime juice pique the flavors. Well, yesterday was an action packed day. We've been working on a photography job so we've been staying pretty close to Ingram St. these past few days. In fact, the only adventure of any note was on Wednesday evening when we got to visit Silver Cup Studios with Jason, a reader of this site. He contacted us when we moved back to New York to see if we would be interested in visiting his workplace, the studios where The Sopranos are filmed. The answer was a resounding Yes! and on Wednesday evening we got to see where the magic happens and even a bit of the magic itself, since they were filming that evening. No, we can't tell you what we saw, it's a secret. The empty sets were almost more fun than the set where the actors were filming. There's something about the space that sets your imagination afire. The spaces are so perfectly preserved and empty, just waiting for someone to come in and bring it all to life. Thanks again Jason! We had a wonderful time meeting you and touring the studio. Yesterday we attempted to go to lunch at 'Ino but it was packed. So we decided to try out Ditch Plains, where the staff is friendly and the food is tasty. The oysters were well shucked and juicy, the Eggs Benedict was loaded with lobster and the mac and cheese was one of the best I've had in a restaurant. We did some window shoping around the village and then moved uptown to look for parking in the theater district. We found on-street, unmetered parking for the second time that day, a minor miracle, and walked up to the Time Warner for more window shopping and menu perusing. We discussed the new pricing at Per Se $250/person for a set menu, no choices and supplements for premium ingredients such as foie gras. This is up from last year and led to a discussion about restaurant prices in New York in general. We both understand that premium ingredients are expensive, rents are extremely high and you have to pay well to attract great staff, but I'm wondering if there's a glass ceiling on menu prices and where it is. As a culinary student and as a young cook I used to be frustrated because I couldn't eat at many of the great restaurants because they were so expensive. All these years later, I now feel the same way again. Finally we wandered back downtown and met Mom & Uncle Steve at Le Madeleine for a pre-theater dinner. It's a comfortable, cozy bistro that is exactly the kind of place that is perfect for a quick meal before a show. We went to see A Chorus Line, which was one of my favorite productions as a teenager. The tickets and dinner were a Hanukkah/birthday present from Uncle Steve and Claire. We thoroughly enjoyed the entire evening. As we walked towards the car after the theater, I noticed that the lock looked funny. It was separated from the car door in a way that it hadn't been when we left. Upon closer inspection the paint around the lock was slightly chipped and it looked as though someone had jammed a flathead screwdriver between the lock and the door. When we opened up the car, we discovered that someone had indeed been inside and had broken into the center console to search for hidden treasures. Ironically the console had not been locked so there was no need for force once they were ensconced in the vehicle. As a result, repairs will be needed on both the lock and the console. Fortunately the thief got nothing more than an open roll of quarters and some older prescription sunglasses. The car was basically intact and we were relatively unscathed by the incident. It does make garage fees look much more palatable, but even parking in a garage is no guarantee against theft in the city. But even this could not ruin the evening. It was just a blip on the radar of a basically excellent Saturday. We came across some beautiful long shallots at the market recently. We braised them in Kola Nut butter. 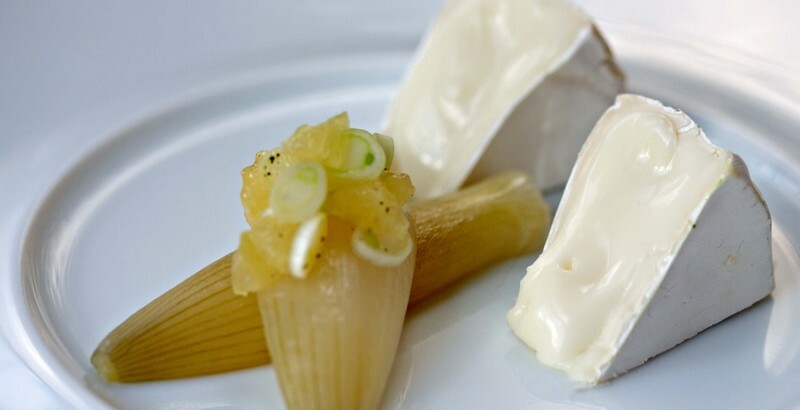 In this dish we served the warmed shallot topped with Meyer Lemon and scallions alongside MouCo's Camembert cheese. Who ate the dish? Well we did of course. We are very pleased to announce that Ideas in Food, the Photographs will be in stock at one of our very favorite stores: Kitchen Arts and Letters. They only have a sample copy at the moment, but that means that those of you in the New York City area can stroll in and check out an actual hard copy of the book. You can put your name down to reserve a copy (they should be arriving soon) or you can order it on-line, the price will be the same either way. Best of all, while you're there you can shop in one of the most comprehensive cookbook stores in the country. They have all of those obscure food science tomes, one of the best selections of foreign cookbooks available in this country, specialty out of print cookbooks, treatises on almost any individual cooking subject and ingredient you can imagine, wine books and everything from Thomas Keller to Betty Crocker. I must warn you, it's a dangerous store. Few people have been known to walk out of there empty-handed. Nach and Matt really know their stuff and if they haven't heard of it, it's probably not worth finding. Matt's been our go-to guy for years. He's introduced us to some amazing books from around the world. We're so excited that our book will now be among the many precious volumes to be found in their shop. So what are you waiting for? Go check it out. Kitchen Arts & Letters is located on the east side of Lexington Avenue between 93rd and 94th Streets. Here is a link to Chuck's new website chuckeats.com . Chuck managed to make the trek out to Keyah Grande twice during our last months there. He has also traveled to a few other restaurants and shared his opinion on his new website. Anyway, if you want to see our last long menu cooked or see the food of a number of other chefs, check it out. The first time I met this vegetable it was referred to as a Jerusalem Artichoke. Now it is more commonly known as the Sunchoke. Both names are derived from the fact that it is a member of the Sunflower family. The Italian word girasole is translated into English as sunflower. 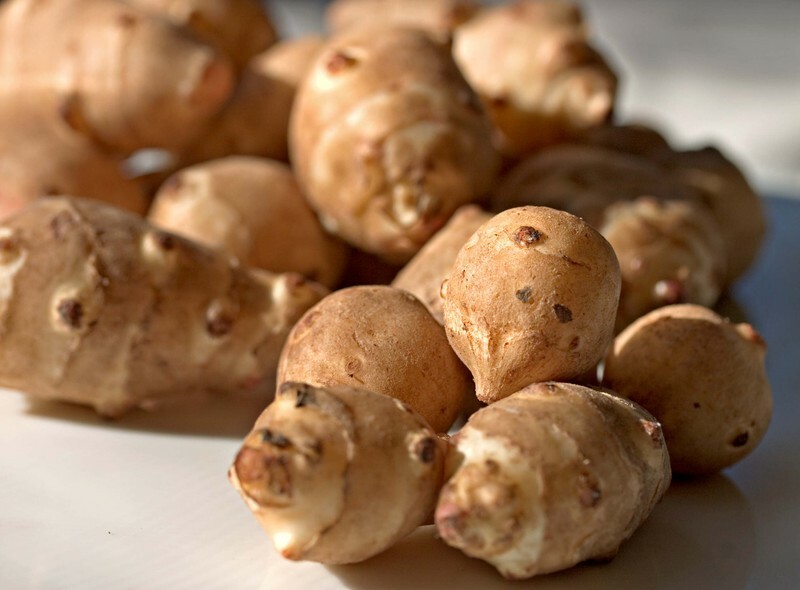 The Jerusalem in Jerusalem Artichoke is considered to be a bastardization of girasole. The moniker of artichoke was added on to denote the flavor profile of the plant, which does taste remarkably like an artichoke heart. During my first introduction to this vegetable it was peeled and diced, cooked down with heavy cream, pureed with butter and strained to make a silken, dreamy spoonful. It can be served as a rich potage in small cups, garnished with shavings of white truffle as a special treat on a snowy evening. Or it can be left a little bit thicker and snuggled up alongside a crackling slice of roast pig with a scattering of mushrooms and winter savory. It can be slow poached in milk and then whizzed in a blender and poured over an equal weight of white chocolate chunks to melt into a sweetly savory ganache. It can be scrubbed, sliced and pickled in a blend of hot vinegar, chili peppers, herbs and agave syrup to create delicately crunchy condiment. It can be mashed or hashed or roasted in a hot oven with butter and garlic for a molten side dish to a perfectly roasted chicken. It can be sliced, fried and dusted with sugar or salt for to create an addictively crunchy taste sensation. Sunchokes can be found in the market seasonally from October to March. They should be plump and heavy with basically unblemished skins and an almost translucent shiny patina, much like good ginger root. Once they start to look dry and withered they are well past their prime and should be avoided. As with most produce, if it doesn't look healthy and appetizing on the shelf, it probably won't improve itself in your kitchen. They are best stored wrapped in a couple of paper towels in a plastic bag in the vegetable drawer of your refrigerator. Jerusalem Artichokes can be used peeled or unpeeled, depending upon your preferences. Although recipes for raw sunchokes abound, be careful, they are know to cause flatulence and some sources recommend blanching the vegetables before consuming them. They do oxidize, so when their skins are removed hold them in acidulated water until they're ready to be cooked. Also they cook relatively quickly so if you're playing with them for the first time, keep a sharp eye on the process. Treat them like your favorite root vegetable (with a slightly shorter cooking time) and you will quickly discover the versatility and deliciousness of this humble tuber. I'm debating the purchase of an Urban Compost Tumbler. Here at home in Forest Hills I can position the composter in a corner on the front porch. It may even take me step closer to my other project. I've always wanted to put in a small garden out in the backyard. It's a small green space and some of the neighbors have planted tomatoes and such in their yards. Unfortunately I've never had much of a green thumb. Growing up here in the city I developed a rather large aversion for dirt and worms. Lying on the grass in the front yard looking at the clouds was very different from digging in the dirt with the worms and the spiders. Several years in Colorado have cured me of my irrational fear of dirt (my fear of spiders is greatly diminished but still remains). That leaves only my fear of commitment, a garden seems like a rather large responsibility, especially since I don't know how long I'll be here. It could be weeks or years. Who will take care of my garden when I'm gone? Will it be worth the efforts to put it in if I won't be there to enjoy the results? When we worked in Maine we had the luxury of a gardener. She tended to the grounds at the hotel and one of her responsibilities was a garden for the kitchen. There were also a couple of cherry trees but the birds beat us to the fruit, leaving just a few sickly looking cherries for human consumption. The garden was an asset and in return for her efforts, we composted all of the kitchen waste. In fact we generated so much kitchen waste that her husband was forced to build a three bin composting system in order to handle the excess. It was great lesson for us to actually see the vast quantities of recyclable waste products that emerged from our kitchen. In Colorado, composting and recycling were out of the question. At various times members of our staff made the effort to try and recycle the huge amounts of waste on their own, but the lack of support quickly stifled these efforts. The recycling center was at the far end of town town and anyone wishing to recycle was to use their own time and their own vehicles to do so. Even the most ardent environmentalists quickly became bitter and disillusioned by the amount of work involved and the lack of interest at the top level. Frankly any efforts were viewed as a waste of time. The feeling was that there was a perfectly acceptable dump on the property and no need to transport large quantities of garbage to town. It was strange to be in such a beautiful wilderness where people cared so little about protecting and preserving the environment. Now that we're back in the kitchen I am once again confronted by the waste that comes from coffee grinds and vegetable peelings. 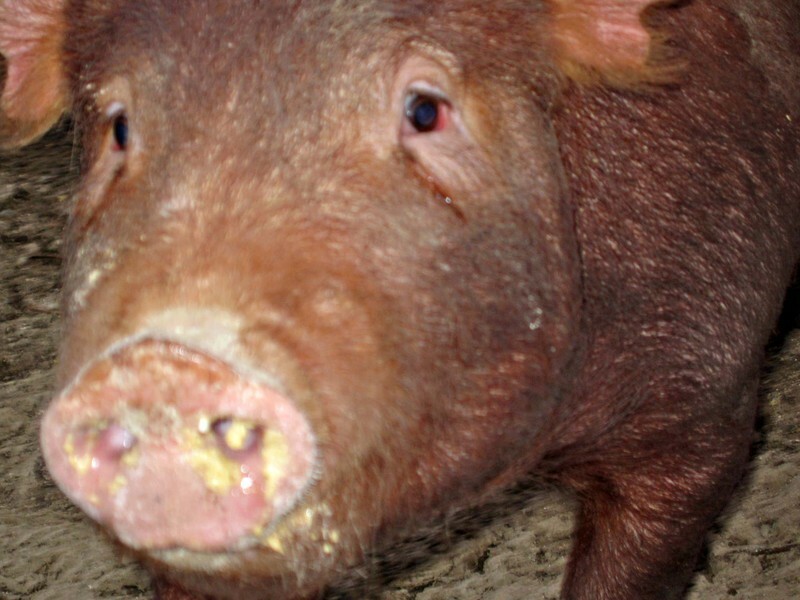 So I'm researching composters. I know myself well enough to realize that I won't be donning boots and taking a shovel to a compost pile in the backyard. Instead any such endeavor would probably attract the prolific population of squirrels that reside in the neighborhood, in turn bringing the wrath of our neighbors down on my head. Alternatively Alex would end up having to take care of it and I'd have to deal with his long-suffering huffing every time he had to go deal with my project. It's better to just get something that I can handle myself. The Urban Compost Tumbler seems like a good solution. Keeping it on the porch will be relatively convenient. Since it will right by the front door, filling it and giving it a spin should not be a hardship for anyone walking through the door. I'll be able to utilize the compost in the front and backyards and I'm sue I can find someone to give it to if we generate too much. Best of all, it's supposed to work relatively quickly so we may have a fighting chance of keeping up with the green waste that emerges from our kitchen. My question is will it actually work? If anyone out there has had any experience with this model or can recommend any other composters I'd appreciate the input. I'd like to get our composting program up and running, but if I'm going to invest in a composter, they're not inexpensive, I'd like to make sure that it actually works. Green is good but green and functional is better. The restaurant business is not for the faint of heart. Once you've taken your first job, whether it be in the front or back of the house, you quickly discover whether or not the business is for you. There are many different restaurants out there, each with it's own style of management and personality type but certain things are constants. The hours are long, the pay is not great in the back of the house, the atmosphere is somewhat like high school due to the long hours of enforced intimacy, there is constant drama and you must have nerves of steel. Except for the pay scale, these principles pretty much apply to all positions in all restaurants from the dishwasher to the General Manager. Very few endeavors require more work and stress than a restaurant opening. Unfortunately, once the doors are open, the stress levels out but it doesn't really decrease. Ever. The idea of a restaurant that runs itself is laughable and totally unrealistic. But those of us in the business must love a challenge. There's no other explanation for why we do the things that we do. Our current challenge is to decide on our next course of action. We're torn between two options, putting together the money to buy a 40-60 seat restaurant somewhere outside the city with or without rooms, or put together the money to lease a small place in the city (most likely in Queens or Brooklyn) a la Gabrielle Hamilton, open on a shoestring and see what we can do basically on our own resources. They are both tempting options and we are still debating the pros and cons of these different directions. Although frankly, we're starting to lean toward the lease option and retaining the majority of control with minimal debt. Either project will require investors and loans but the scale of the project will determine how quickly we can make our money back and pay everyone off. You make less money with fewer seats but it also requires less money to get the doors open. The properties that we've looked at recently have shown us the great range of what's available withing a given price point. We've looked at places in the Berkshires and upstate NY in a price range of $600,000-$895,000. Everything requires a certain amount of work to bring it up to our standards. It's amazing how few places take the trouble to clean their kitchens (and other areas) before showing them to prospective buyers. They could hire an outside contractor to clean the place for a couple hundred dollars and it would probably increase the perceived value of the property by thousands of dollars. The places we saw would require anything from $20,000 to $100,000 to get them up to our standards and get the doors open. This is on top of the asking price, which does not include any miscellaneous fees for lawyers, certificate transfers, inspections, etc. You would also have to factor in the time it takes to make the upgrades and process the sale. All in all, buying a property means the soonest we could have our doors open would be three to six months after we found the right property and that is a very generous estimate. On the other hand, if we found a leased property in the city we have the advantage of being able to negotiate a build-out. Generally there is a grace period for renovations before the tenant starts paying rent. If you can find a landlord willing to do the build-out and add the cost to the lease then you get a bit of a cushion in which to get the doors open. Even if we need to pay for the renovations ourselves, since we would be dealing with a much smaller space and we have friends in the area who can help us out with some of the finishing work, theoretically it would still be less expensive than refurbishing a much larger space in the country. It's all just a theory at this point. So, now we're going to use the next couple of weeks before the cruise to start pounding the pavement in the city and see what's available. This way we'll have a firm foundation of information on which to make a decision. I don't think we'll come to any firm conclusions before the cruise. Actually that time away from the situation may be what we need to help clarify how we want to proceed. We know that the type of food we do will be well-received in New York. It's just that neither of us had any great desire to relocate here permanently. I won't go into the laundry list of reasons of why that is here, suffice it to say that although we love New York, it's not where we intended to make our next home. Circumstances have a way of surprising us and sometimes you just have to go with it. Sometimes we ponder whether or not we want to open up a new restaurant at all. I'm sure it's just a lingering hangover from our experiences in Colorado. But there are days when we wonder if we're insane to keep doing this. I mean we're definitely insane, all professional cooks are a little bit nutty, but insane enough to keep banging our heads against a wall? Then our love of cooking and food resurfaces and we carry on. After all what we would do without a kitchen from which to entertain people? On the bright side, we've almost finished revamping and unpacking the kitchen here in Queens. We've got dishes and ingredients and equipment. Now all we need are people to cook for. We'll be available to cater dinners in the New York area beginning February 21. Anyone interested can email us for rates and information through this site. It won't be inexpensive but it will be worth the experience. We may even have a couple of dinner parties of our own here at the house. We are also going to put together couple of dinners with Shola in Philly for when we get back from the cruise. That will be fun. We can't wait to get into his kitchen and see where the magic happens. Tomorrow we start combing Craigslist in earnest and looking at rentals. If anyone knows of anything they think we might find interesting, please drop us a line. We'll be in the kitchen tomorrow and Thursday working with cheese so we'll get some new dishes up in the next day or two. Thanks for your patience in waiting for those. I can't tell you how good it feels to finally have a kitchen again! I've been thinking a lot about Thai flavors today. This is partially because we had dinner at a Thai restaurant last night. It was a lot of fun. We chose a casual restaurant because the priority was the company, not the food. The meal was better than expected with a generous smattering of heat and spice, contrasting textures, fresh herbs and many layered flavors. 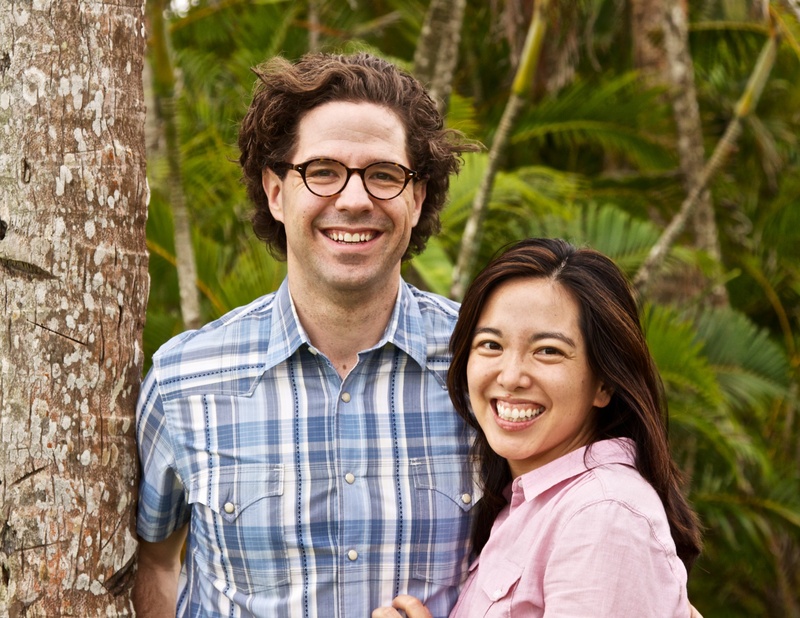 Oddly when we arrived home last night Iron Chef America was on featuring Ian Chalmerkittichai. It was quite interesting to see his Thai-inspired dishes and the juxtaposition of flavors. Then this afternoon I was cooking some broccoli rabe and searching the pantry for some heat, which would normally found in the form of crushed red pepper. Unfortunately this was sadly absent from our kitchen as we still need to restock the pantry. The solution was a Thai garlic and chili sauce that we had received for Christmas. It's flavors were sweet, spicy, savory and piquant. I seared my sliced onions, added the sauce to the hot pan to bring out it's flavors, then added the broccoli rabe and steamed it to a pleasant tender bite. The flavor pairing was surprisingly harmonious with the aromatic sugary, peppery, and garlicky characteristics of the Thai sauce creating a perfect counterpoint to the slightly bitter vegetable. Thai food is not a cuisine that either of has explored in depth. I love the layered flavors, the fresh herbs, the spiciness and the crunchiness that you find in that cuisine. Growing up there was a plethora of Japanese and Chinese restaurants that we frequented but Thai and Vietnamese restaurants were scarce. The first Vietnamese restaurant I ever visited was actually in Boulder, Colorado. My roommate at the time was from Texas and she loved Vietnamese food. So when she found a restaurant nearby, she dragged me there immediately to try the food. It quickly became a favorite for an off-campus splurge. We were addicted to the Vietnamese spring rolls. These were served piping hot and crispy with cold rice noodles, lettuce leaves and a sweet dipping sauce. We wrapped the warm spring rolls in the cold lettuce leaves with the toothsome rice noodles and happily dipped and crunched our way through countless meals. The first Thai food I ever ate was in high school a a small restaurant on Queens Boulevard. It was memorable mostly for the intense spiciness of the dishes and the plethora of mint and cilantro, neither of which I had developed a taste for at that tender age. We tried it once or twice more, I liked the glss noodles with minced pork and then it faded quietly from our consciousness. We visited one or two other neighborhood restaurants that popped up over the years but I couldn't help feeling as though there was something missing. The food was good but there didn't seem to be much to differentiate it from Chinese food than an inherent sweetness and the presence of lemon grass. I knew there had to be more to Thai food than what we were tasting but I had no idea where to find it. Kittichai had actually been recommended to us last year but we went to Sripraphai instead. We wanted to try some great authentic Thai food (and we did, I can't vouch for it's authenticity but it was delicious) but neither of us was ready to commit to a high end Thai restaurant. There were simply too many other places on our list to visit. This is interesting to me because for the most part, the only truly high end Asian restaurants that we go to are Japanese. When I was younger I visited Shun Lee near Lincoln Center a few times, more for the experience than the food. The restaurant was beautiful and formal and the food was very good. The dish I remember most was a rack of lamb because it was not something I ever expected to eat in a Chinese restaurant. But I was never convinced that food was better than what you could find in some of the more relaxed places in Chinatown. This felt especially true because in spite of the lavish surroundings, Shun Lee had many of my favorites from the local Chinese places that delivered to our home. I'm thinking that this year, in spite of a much tightened budget, we may have to take the plunge and visit Kittichai to see what the fuss is about. Sripraphai was fabulous but I'd like to move up to the next level. Thai food is definitely something that we need to explore further. The beauty of cooking is that there is always something new to pique our curiosity and stretch the brain a bit. I didn't expect dinner last night to send me down a new path of culinary exploration but here we are. Which just goes to show you that it doesn't have to best restaurant or the most expensive one to offer new inspirations. It just has to offer you a new perspective to explore. 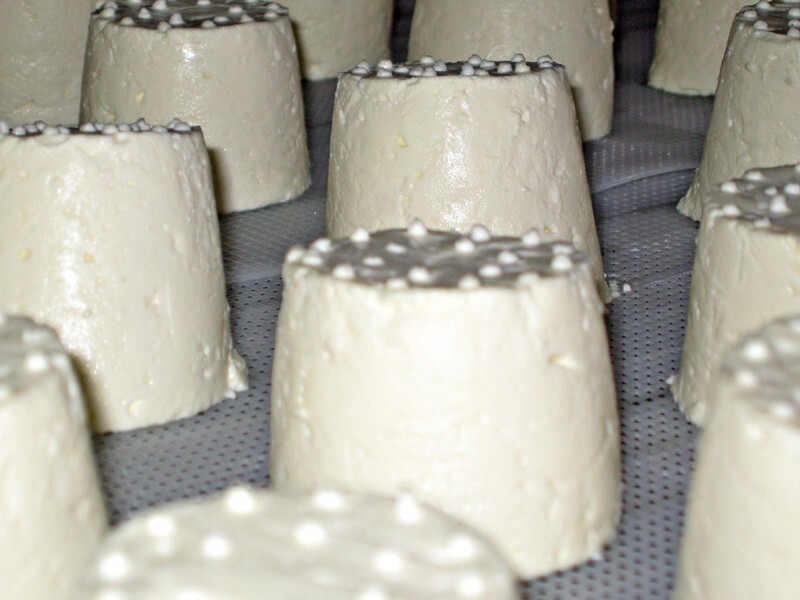 Here is a great shot of some really tasty fresh sheeps's milk cheese in the making from 3 Corner Field Farm. We were lucky enough to sneak a peak at the cheese room where this fresh cheese was resting on racks. We also had the opportunity to eat a slightly more mature version of this cheese. 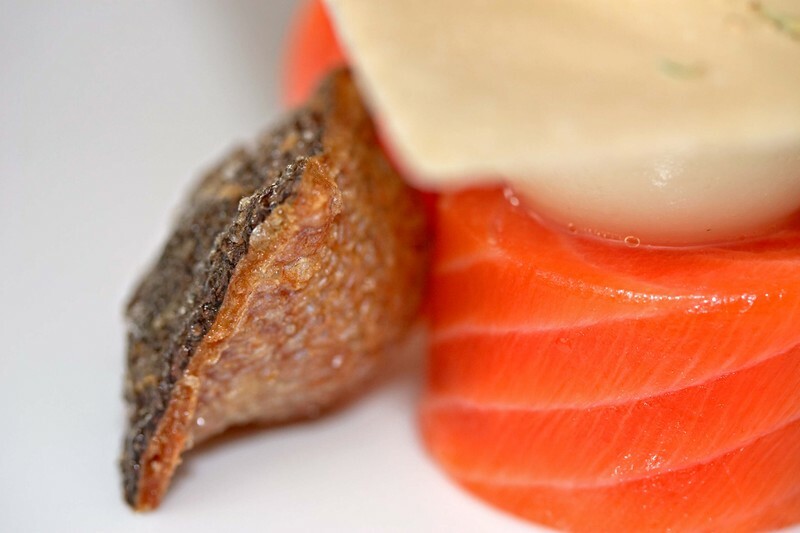 It sparked the idea of a dried fruit draped sheep's milk cheese with white anchovies and Lampong pepper puree. Here is another one of the great introductions we made on our recent trip. Recently things have been a bit sparse around here and for that we apologize. Time just seems to be getting away from us. In Colorado it felt as though we were looking for things to fill our days and here in New York we are constantly taken off guard by the passage of time. It's almost always later than we think it is. There don't seem to be enough hours in the day to get everything done. We may have a store in the city that will be carrying the hard cover version of the book. If that happens, some of you will be able to peruse it's pages before making your purchase. Sales have been steady and we want to thank all of your for your support. The hardcover book takes a few weeks to arrive in your mailbox, one of the downsides of self-publishing, but we think the difference in quality is worth it. For those of you who have had trouble trying to purchase the book, you must click on the blue "Buy Now" button in order for the link to work. 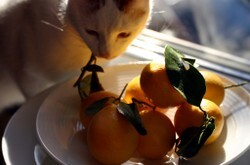 Alternatively you can go to www.lulu.com and search for Ideas in Food in books. 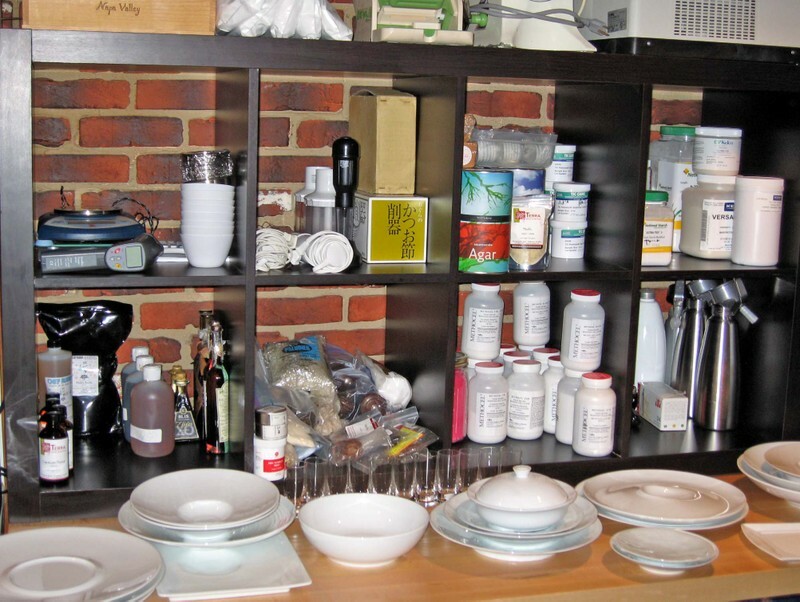 We are re-organizing the kitchen (and other parts of the house) in Queens to get things ready for some serious cooking. We're also trying to finish up our recipes for the Holland America cruise in the beginning of February. We have just lined up our first paying food photography assignment and we're going to be working on that next week. We can't wait to get back in the kitchen and there will soon be some fresh photos for you to ponder. We've also made a trip to the Berkshires and upstate New York to look at properties. We've put faces to names with some very cool people and made several new and positive acquaintances, both in person and on-line, over the last week. To think we've only been back East for nine days. The changes have been amazing and we're truly excited to see what the future will bring. It's amazing to think that a simple change in geography can make such a big difference in our live. It's making us really evaluate where we want to be and what we want to do. We have this incredible sense of energy and excitement that has been missing in our lives for quite some time. The possibilities seem endless. It's very important for us to make the most of our time and energy and really savor life's experiences. This website has become a great resource for us and we want to thank all of our readers for helping to enrich our culinary experiences and to inspire us to keep on pushing the envelope. We couldn't do it without you. 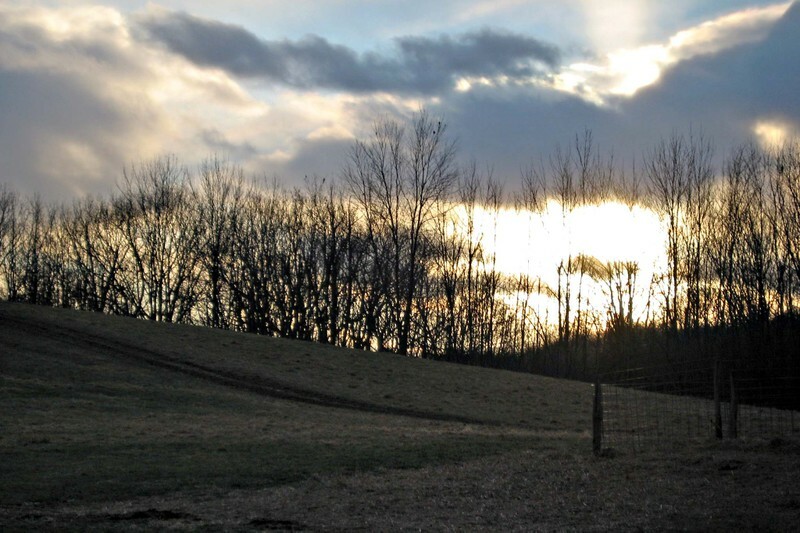 The crisp clarity of a sunset in the dead of winter. Now the question is what is possible? There are a lot of restaurants in New York that treat all wine purchases in the same manner. Whether you buy it by the bottle or by the glass, you are presented with the bottle, offered a taste and then poured a glass. It's a wonderful thing to know that you are being served what you asked for and to be able to check the quality of your libation before making a commitment. I am rarely presented a bottle that is less than half-full. It's something that struck me as we struggled with the wine service in Colorado. The reason for our struggle is that it's illegal to marry bottles of liquor in that state. What that means is that you cannot pour from one open bottle into another open bottle regardless of whether or not the contents are the same. So either you present a miserly looking bottle and run the risk of occasionally running out of wine before the glass is full, or you must find a use for all of that perfectly good wine that is left in the bottles that are not full enough to take to the tables. Apparently this is not in the case in New York. In a very high end restaurant in the city, bottles were married in the service station in plain view of the diners, if they chose to look. Oddly the same funnel was used for all bottles with no pretense of rinsing it between different wines. Now this may seem like a small omission, how much contamination would actually occur? But if you consider the fact that they go to the trouble of presenting each bottle of wine, how much more difficult would it be to rinse the funnel between wines or even have separate funnels for each varietal? It's always interesting to see where people draw their lines in the sand and what constitutes an acceptable practice in any given restaurant. One of the great things about truffles is the ability to shave them to a certain thickness over a variety of dishes where the aroma is released and perfumes the dish and the diner. Similarly, truffles can be shaved and folded into sauces for flavor and textural enhancement. That is all well and good if you have plenty of truffles on hand, but the experience, aroma, texture is also instrumental. And so I ask, any idea on making new truffles, any flavor aroma etc which can be utilized to specific dishes, shaved and folded into ragouts etc. 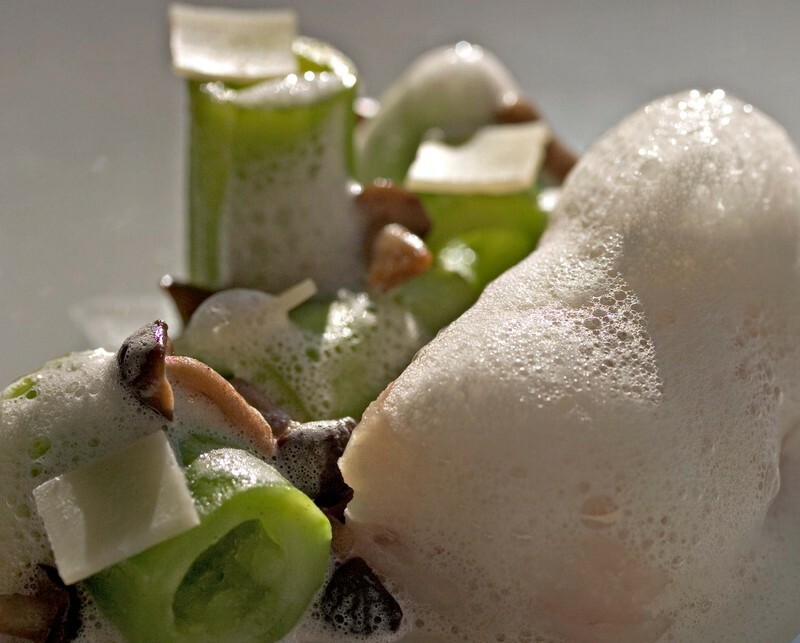 For instance a fall vegetable and mushroom ragout with spruce-walnut truffles shaved on top. I think this is a key concept for the development of dishes...thoughts: I am thinking a gellan/agar base, for that soft crumble texture with bite. Here is our recipe for our sunflower seed risotto. In this case we prepare it with smoked trout, though really any kind of mix in works great: from truffle-bacon-jalapeno to fresh crab meat to Japanese eel with some umeboshi and shiso. Melt the butter and olive oil together in the bottom of a pressure cooker. Add the diced onion and sweat until tender. Season the onions with a pinch of salt. Add the sunflower seeds and continue to cook until the seeds are lightly toasted. Deglaze the pan with the vermouth. Cook until the pan is near dry. Add the chicken broth, another pinch of salt and cover the pressure cooker. Cook under pressure for 40 minutes. When the time is up release the pressure, strain the seeds and reserve the liquid separately. Puree one third of the seeds with some of the cooking liquid until a smooth fluid puree is formed. Strain the puree through a fine mesh sieve, and mix with the reserved sunflower seeds. This is the risotto base. To serve, heat the base in a pot. Fold in the lemon zest, sliced scallions, crème fraiche and flaked trout. When the mixture is hot emulsify in the butter, grate in the cheese and taste for seasoning. Reserve some grated cheese to top the risotto. Spoon the risotto into bowls and top with the cheese and fresh ground black pepper. If you're dining out and your front waiter is inattentive and sloppy, your food runner is perfunctory and your back server works hard and does a great job in spite of the fact that it's clear that he really doesn't speak English, is it fair that of the three of them he will probably make the least amount of money? You still have to tip well because otherwise the person who actually did a good job will not get compensated. Of course, since he only gets a percentage of what you're going to leave and the front waiter will take the lion's share, it can be a tough thing to do. In a perfect world you could tip people for great service and leave less money for those who don't pass muster, but in the real world of teamwork it's all or nothing. So let that be a lesson to all of us to choose our teams carefully. You may be more affected by the actions of the person standing next to you than you realize when you sign on. The first experience of... What is so important about the first. Think about the many firsts you have experienced and those countless others which have yet to happen. Tonight we opened a bottle of Van Der Heyden, 2000 Napa Valley Cabernet. It's rich and luscious with deep fruit flavors and a hint of age, it's slightly sweet and calling for foie gras or beef, it's complex and beautiful and...a Late Harvest dessert wine. I just read the fine print. And it is amazing. Of course, I did not realize I was opening a late harvest bottle for the two of us. I thought I was opening a Cabernet but as I sit and sip, savor and ponder, I realize that it was the perfect choice for tonight. I can remember the first time we tasted the Van Der Heyden wine in their tasting room, a dusty cob web filled room brimming with delicious wines, where the wine is king and the great tastes are queen. We were brought there by a good friend and fellow chef who was working in Napa at the time. Upon our arrival at the tasting room, we wondered what we had gotten ourselves into. It was dusty and funky and there were strange bugs in bottles on the dusty shelves, or so my memory dictates. But our friend knew what he was doing and the wines were complex and delicious. We've been members of their wine club since it began and we are constantly beguiled by their offerings of old favorites and new offerings. We have yet to be disappointed by their selections, really their creations. Appearances can be deceiving and had we judged them by their tasting room and never sipped a wine, we would have missed out on something truly special. When we taste their wines we think of Breen taking us around on that trip, showing us the way and sharing his discoveries on the wine trail. It's a reminder to us to accept what people have to offer and be grateful for what they are willing to share. It's a reminder to share things that we value with others and help them find the things they might not find their own. It's a lot of information from a bottle of wine and that's even before we crack the seal and apply a corkscrew to the bottle. No, we have not stopped writing and picture taking, it just takes a few hours to drive cross country. We arrived in Queens, just past midnight, after driving straight across the country. Our brains are a bit fried and cloudy right now, though we figure a couple hours of sleep might cure these symptoms.